It’s fairly simple to get kids talking (and writing) about math strategies during whole-class strategizing sessions, small group modeling, and one-on-one practice. We as teachers just memorize the leading questions (How do you know? Can you prove your answer? What’s another way to solve?) and we have lots of go-to phrases that help us push back on and extend students’ responses. But what happens when you’re NOT facilitating? Not much criticial thinking happening, right? So how can you make sure students are analyzing their problem solving process even when you’re not facilitating the conversation? And so the best solutions I’ve found are partner discussion cards and math talk posters that indicate not only a question or stem to get the conversation going, but also the sentence starter that the other student can use to help him or her form an answer. Here’s an example from some partner discussion cards I made for K-12 Common Core math practices (MP1-MP8). CCSS math practices are skills that should be integrated and practiced with every math concept we teach. They include skills like making sense of problems and persevering in solving them, reasoning abstractly and quantitatively, and using appropriate tools strategically. As you can see from the photo, the student sitting on the left asks the question. The student on the right uses the sentence starter to help him or her respond to the question. They can then switch roles with either the same card or choose a new card. Choose one specific math practice (or problem solving skill, depending on the type of cards you made or bought) and pass out the discussion cards for that math practice to each pair or group of students. Challenge kids to pick one of the cards during each math activity you do and discuss it together. Place the entire set of discussion cards in your math center area. Challenge students to pick one question to answer (verbally and/or in writing via a math journal) each time they go to the center. Choose one discussion card for each lesson or activity. Display the card for the class to see, and challenge students to delve deeply into it through written reflections and conversations. An alternative to math discussion cards is math discussion posters. Just like with the cards above, you can easily make these posters yourself, or save yourself time and purchase the set that I made. The one below has 8 discussion general math discussion posters and 4 conversation extender posters to help students add on to one another’s thinking or push back and clarify. Designate a bulletin board for the posters. Introduce one math conversation at a time, displaying the poster on your bulletin board as you model and practice it extensively as a class before asking students to try it with a partner. Display all the posters for students and challenge them to choose one (or more) to use during group projects, collaborative activities, math centers, math stations, math games, and so on. Leave the display up for students to reference when they are having unstructured conversations during math activities and get stuck. Rather than asking the questions yourself or prompting students about what to say, encourage them to reference the board and find a sentence starter to help them. Print the smaller version and create individual cards for students to keep at their group area or in math centers, and use them the same way as the cards described above. Keep in mind that tools like math discussion cards and conversation posters will help support students in talking about their problem solving, but kids will continue to need lots of modeling, practice, and support. Don’t get discouraged if it takes awhile for your class to start having the kind of meaningful discussions you know they’re capable of. This is definitely a process! Try implementing these 10 simple classroom routines to get kids talking (and writing) about math strategies. Remember the key: support students with questions or stems to get the conversation going, AND the sentence starters that other student(s) can use to help form the response. The more kids practice, the more natural these conversations will become. 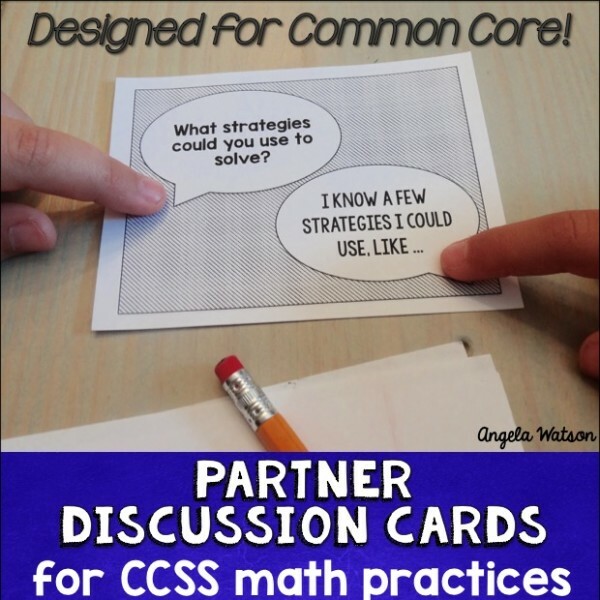 Have you tried math talk cards or posters with your students? How do you help your students become more independent in discussing problem solving strategies? This is excellent Angela. My kiddos always talked for .5 seconds and then told me they were done. These discussion starters are a great accountability tool and aid in thoughtful, productive discussion. Thanks for creating this resource- I’ll be sure to share with my new teachers! Yep, I had the exact same problem! (Kind of like when you ask them to clean out their desks, and they move 2 papers and call it good. Hah!) The more explicit we are in teaching what we mean and the more support we give kids in meeting the expectation, the more likely they are to be successful.